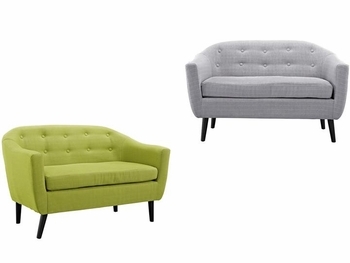 Inventive conversations and sharp repartee compliment the Wit Loveseat. Designed according to the mid-century modern style, with an emphasis on imparting a sense of ambition and organic living, Wit is gracefully positioned for everyday gatherings and get-togethers. Outfitted with solid rubberwood dowel legs, and finely upholstered in polyester fabric, Wit imbues progressive resolve while delivering an eminently versatile piece. Wit works well in contemorary living rooms, lounge and reception areas.